Vancouver, BC (December 2nd, 2013) – Roots of Fight celebrates martial arts icon “Judo” Gene LeBell with the release of a short film and accompanying t-shirt, on the anniversary of what is considered the first televised Mixed Martial Arts contest in history, when he faced former middleweight boxer Milo Savage in Salt Lake City, Utah on December 2, 1963. Responding to a challenge by boxer Jim Beck in Rogue magazine, where he called judo “a complete fraud” and offered $1,000 to any judoka that could defeat a boxer, Gene LeBell agreed to face handpicked Milo Savage in the very first Judo vs. Boxing competition. “That’s the guy that stepped in and did MMA before there was ever MMA,” said veteran MMA referee “Big” John McCarthy. In the fourth round of a five-round bout, LeBell used a traditional harai goshi throw to get Savage to the ground, where he proceeded to take the boxer’s back and choke him to sleep in front of an upset hometown crowd. Vintage dyed & washed T for super soft hand feel with specialty print. To accompany the event-based shirt which depicts the Judo vs. Boxing match-up, Roots of Fight has released a short film featuring rare footage of LeBell vs. Savage, with commentary from “Judo” Gene protégé’ and UFC champion Ronda Rousey, her mother, the first American World Judo Champion Dr. Ann Maria DeMars, former two-division UFC champion BJ Penn, and more. Roots of Fight - Gene LeBell vs Savage featuring Ronda Rousey from Roots of Fight on Vimeo. 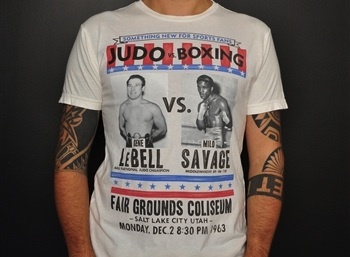 For more information on Roots of Fight, visit www.rootsoffight.com. Roots Of Fight pays tribute to the rich history and tradition of martial arts from regions around the globe and connects the history and images of iconic fighters like Muhammad Ali® Bruce Lee™ Helio Gracie and Mike Tyson with the contemporary global scale of mixed martial arts. Roots Of Fight tells an authentic story that reflects a genuine place and time and weaves the true stories of icons from the past with those of the present - paying homage to the roots, regional influence and diversity of each discipline. The “Sweet Science”, “Jun Fan Gung Fu”, “Gracie Jiu Jitsu”, “Jeet Kune Do” along with “Muay Thai” and Krav Maga – legends about these fighting systems and others are explored by Roots Of Fight.